FortiFlora contains active live cultures and a special strain of probiotics to help promote intestinal health and balance in dogs and cats. FortiFlora has been shown to be safe for use, and has excellent palatability. 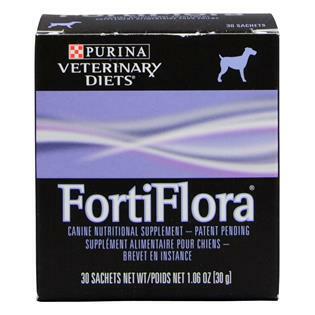 FortiFlora is great for any pet to help promote happy, healthy tummies. FortiFlora, by Purina, is the number one probiotic recommended by veterinarians in the United States. It contains a special strain of probiotic that has been proven to promote intestinal health and balance, as well as promote immune health. Purina FortiFlora contains high levels of antioxidants such as vitamins A, E, and C, and contains a guaranteed amount of live active cultures, which all work together to give your pet excellent intestinal health. In addition, FortiFlora helps pets that have diarrhea due to stressful situations and food intolerances. And FortiFlora is palatable, so you won't have to worry if your dog or cat will eat it or not.